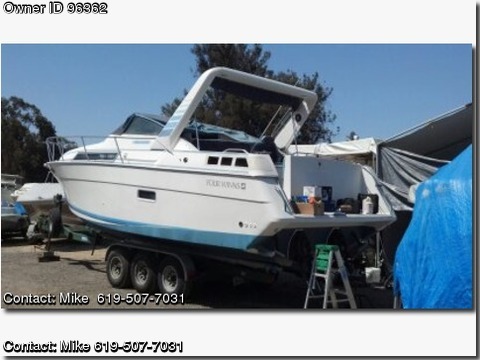 Please call boat owner Mike at 619-507-7031. The Port engine was completely rebuilt in 2012 with only 50 hours, Starboard engine was rebuilt in 2012, reconditioned outdrives in 2014, AC, AM/FM CD with sub & new speakers in 2012, anchor, Bimini top, Camper top, Cockpit cover, Mooring cover, 4 bilge pumps, Coast Guard pack, compass, depthfinder, 2012 Garmin 740S GPS, dockside power, generator, Halon, head, shower, H&C water, hydraulic steering, radar arch, SS prop, Galley, refrig, stove, 2012 custom extended swim platform, storage, trim tabs, 2012 custom Allure flooring, 5 batteries, new battery wiring system including isolator switches, VHF, documented, sleeps 6, prof. maintained, slip available. 2009 Pacific tri-axle trailer. Water ready, must sell moving.